With so many things competing for attention, staying focused on just one can sometimes be a challenge. The InTune essential oil blend is a proprietary blend of essential oils that work together to create an aid for moments of distraction. This blend can be applied topically to enhance and sustain a sense of focus. Enriched with select essential oils, InTune contains Frankincense, Hawaiian Sandalwood, and Lime essential oils to assist with clarity and focus as well as Patchouli, Ylang Ylang, and Roman Chamomile to help calm and soothe. This blend is a perfect study companion and can support the efforts of those who have difficulty paying attention and staying on task. InTune is a great aid to help you stay focused when you need to concentrate. Next time you are studying for a test or reading the lengthy material, use InTune Focus. Simply apply InTune oil to your temples and to the back of your neck during these tasks to help you with concentration. Sometimes our minds get so cluttered that it becomes imperative to take a break and clear our minds. If you find yourself feeling mentally overwhelmed, apply the InTune to your wrists or to the back of your hands and inhale deeply to promote a sense of clarity. You’re halfway through the workday and you’ve just finished lunch. Now, it’s back to work you go. However, after a few minutes of work, you find your focus is waning as you enter into an afternoon slump. To help sustain and enhance a sense of focus, use InTune aromatically or topically. InTune oil will help you stay on task and focused when you’re feeling those sluggish afternoon tendencies. You can experience the focusing properties of InTune everywhere you go with DIY: Aromatherapy Jewelry. Part of the Aromatherapy Jewelry is made of a natural clay pendant. This clay pendant absorbs essential oils easily and is a great way to experience the effects of your favorite oils wherever you are. When you need to concentrate or stay focused, apply a drop of InTune oil to the clay pendant on the necklace to enhance your focus. These necklaces can be customized to your personal aesthetic tastes and will prove to be a valuable piece of jewelry for both beauty and mind. 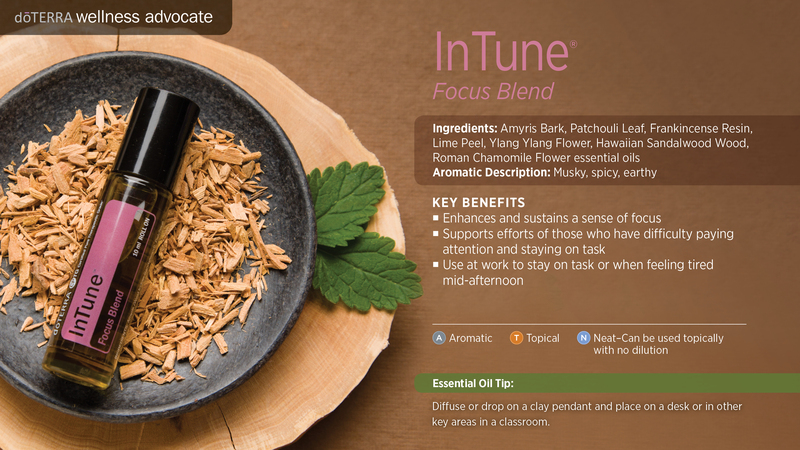 Another way to receive the focusing benefits of InTune is by dispensing the essential oil blend onto a clay pendant and placing it on your desk or in your classroom. Having InTune close by will support your efforts to pay attention and stay on task. Sitting in a classroom or a meeting for long amounts of time can easily cause your mind to drift and lose focus. To make sure you stay attentive during important lectures or discussions, apply the InTune to your temples and to the back of your neck to help enhance and sustain a sense of focus. Childhood is full of learning and growing moments that teach us important foundations for life. Help your children get the most out of their learning experiences by using InTune oil. When your child is having difficulty staying focused during school or extracurricular activities, help them apply InTune to aid them in staying focused and on task. InTune Focus Blend comes in a 10 ml roll-on bottle. The roll-on feature makes it easy to apply topically and the petite bottle makes it convenient to store and carry. These features are opportune, allowing InTune oil to be easily accessed wherever you are, whenever you want. Store InTune in your briefcase, backpack, or purse and keep your focus blend close when you’re in need of a focus boost. Possible skin sensitivity. Keep out of reach of children. If pregnant or under a doctor’s care, consult your physician. Keep out of eyes, inner ears, and sensitive areas. Dilute with doTERRA Fractionated Coconut Oil to minimize any skin sensitivity. Avoid sunlight or UV rays for up to 12 hours after applying the product. We live such busy lives today and although we have planners and every kind of technological reminders, life can still be a little overwhelming. I was recommended that my daughter in law use In Tune while she was taking her Physics class. She also was making a major move to another state, besides having a 10 month old baby, and a job. Although I got it for her, I tried it myself; simply amazing! I’m already an energetic person but besides having energy, we have to be focused and on track in order to do all that we have to on a daily basis. I’m so happy my daughter in law needed this oil blend because I’m not sure when I would have tried In Tune. Everyday I discover another gift from the earth. Thank you Doterra! 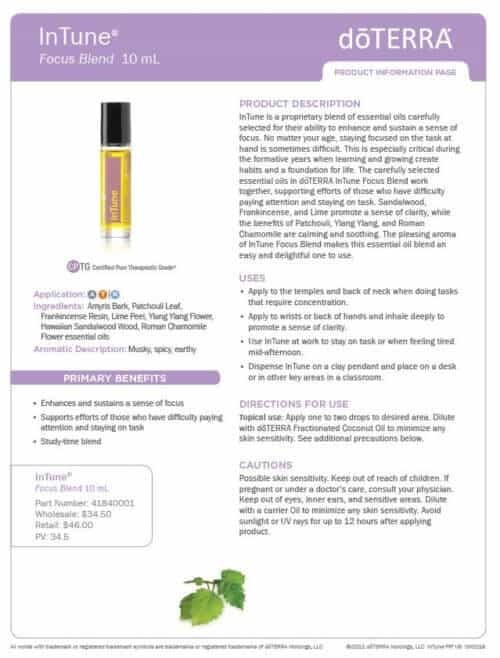 I have a hard time with focus and I use this oil every single day and it helps me soo much! I definitely recommend inTune to anyone who has a hard time focusing because it really works and it’s the natural way to go!